We have already mentioned a service called Crypto Shares that gives you the ability to buy shares earn dividends on them in various crypto related services and even some crypto exchanges. But another exchanged called MCXnow seems to have implemented this approach directly in their own system, you can buy the so called mcxFEE in that exchange that is essentially like a shares of the exchange. There are 100000 mcxFEE total out of which 50000 have been released to the public and are traded on the exchange so if you buy 1 mcxFEE you will receive 0.001% of all exchange fees MCXnow generates. The more of these you purchase, the more from the fees that the exchange collects will be credited to you and the more people trade there the more you will earn. Have in mind that this is a long term investment with a relatively low return rate as compared to what you will have to pay for obtaining 1 “share”, but as you probably will not be mining forever it is a wise idea to invest some of the mined coins into something that will bring you profit on the long term. You are going to be credited your share from the owned mcxFEE every 6 hours depending on the traded alternative cryptos and the collected fees you may receive different kind of cryptos and different amounts each time. The crypto exchange MCXnow also offers another interesting feature that allows you to get more out of your available coins, including the ones you may earn from owning mcxFEE (shares from the exchange). Every 6 hours you will get credited an interest rate on all of your coins that are currently available for trade on the exchange, the interest rate can vary on different coins and can change in time based on how much of these are being traded currently. The reason for the change in the interest rate is that it is something that forms from the collected fees from trades, so the more trades with the coin, the more fees and the higher interest rate you can get. The interest rates you see on the image above are the ones for the last 6 hours and the percentage is an yearly interest rate, so every 6 hours when you get your interest rate it will be a much lower percentage compared to the yearly rate. So even if you don’t actively trade, but do deposit some coins in the exchange you will be earning some interest on top of your deposit. The good thing is that if you buy mcxFEE the interest rate can increase your profits even if you don’t deposit any coins, as the crypto coins you earn from by holding mcxFEE (shares of the exchange) will also get interest rate. According to the official information published by MCXnow, they do have 31551 registered users at the moment and you can see between 5000 and 6000 people available on the exchange most of the time. The number of alternative crypto currencies is still not that big, but the exchange has the potential for serious growth, so if you decide to invest in it on the long run now may be the change to get into it by purchasing some mcxFEE (shares). 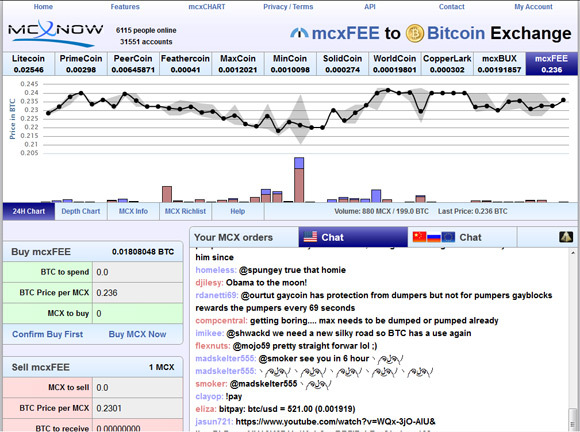 The current price of 1 mcxFEE hovers around 0.24 BTC, so it does not come very cheap, but as we’ve already said this is a long term investment with potential for serious growth in what you could be earn in the not so distant feature. The exchange has been available for quite some time already, so it is not something that just popped up, but there is still risk involved in long term investment as the bright future of all crypto currencies is not so certain. We have already invested into 1 mcxFEE in order to try out how are thing moving there and will probably invest in few more soon if everything continues to run smoothly as it has for the moment. After some time we have decided to sell out 1 mcxFEE due to the constantly declining price of the shares and not so good profitability from the share we had. Crypto Trade is another crypto currency exchange with similar approach, offering users to become shareholders in the exchange by buying shares that earn you percentage of the fees colected from trades executed. At the end of every month, 50% of the website’s net profits are going to be passed onto the public through dividend payments. There are apparently 25,000 shares and each share represents 0.002% of the exchange’s net profits. Currently the price of a single share is 0.195 BTC with over 5000 shares currenty being traded on the exchange. So if long terms investment in crypto currencies is your thing, then you might want to check this option as well.